Lori Ryan is congratulated by TradeNet CEO Tom Mertz for her 15 years with the company. Lori Ryan has color coding down to an art form. As a Graphics Assistant at TradeNet, it’s up to Lori to connect proofs with orders and generally keep things flowing in the Graphics Department. TradeNet most definitely makes the most of Lori’s organizational skills. 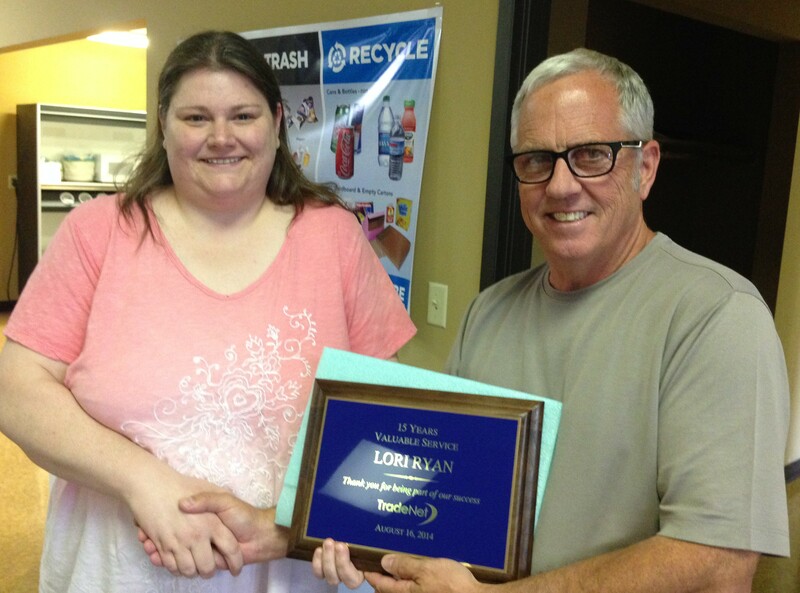 This week Lori was recognized for another aspect of her work at TradeNet, that being 15 years of service. She initially worked in assembly, but for the past six years has been in Graphics. Those around her have come to depend on her strong work ethic and willingness to put in long hours to get the job done. Having a rather long daily drive to work, Lori has been known to stay in a nearby hotel when winter storms move in. Better be safe and not have to risk missing work! Thanks, Lori, for being a true “TradeNetter” for so many years. Everyone at TradeNet appreciates your good work.